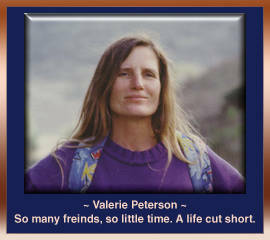 This page is dedicated to Valeria Peterson and an animated memorial for those who love her can be viewed and/or downloaded here. For the downloaded files, be sure to hit your "Esc" key when the animation is over, otherwise it will keep looping. To view the animation, click here. Warning: It takes 4 minutes to download so please be very very!! patient! Or, click the links below to start the download of the files to your computer. They are executable files for the MAC and PC and are virus free!